Thu., Sept. 7, 2017, 8:56 p.m.
PULLMAN – Mike Leach has made an effort to acquaint himself with the Cougar greats who laid the bricks for the program he presides over. Which means getting to know a few of the iconic quarterbacks. Which means friending the guy just down the road, Mark Rypien. Leach has grown especially fond of the Spokanite who played for Cougars in the early-to-mid-1980’s before spending 11 seasons in the NFL, winning two Super Bowls and being named Most Valuable Player in one. Leach said Rypien, at 54 years old, could still play at least three positions for the Cougars and applauded the former QB for his commitment to an active life. Sounds like a bit of an exaggeration, right? It isn’t. “Things haven’t changed,” Rypien said by phone Wednesday morning … from a golf course. Rypien doesn’t have much down time these days and this week has shaped up to be an especially busy one for the ex-Cougar and Shadle Park QB. Rypien flew to Indianapolis Tuesday morning for the LPGA Tour’s Indy Women in Tech Championship at Brickyard Crossing Golf Club – a venue that weaves through the renowned Indianapolis Motor Speedway. He squeezed in 18 holes on Tuesday while competing in a Pro-Am tournament held at the same course. The event sponsors invited Rypien and members of his non-profit organization, the Mark Rypien Foundation, to visit Indy and scope out the tournament. Rypien would someday like to bind two of his favorite hobbies together and bring a larger-scale golf event to the Inland Northwest. But a golf tournament in the Midwest isn’t the reason Rypien’s phone has been buzzing all week. His phone’s been ringing about a football game in the Pacific Northwest – and he probably anticipated this happening more than three years ago when his nephew decided to blaze his own trai at Boise State, rather than build upon the family legacy at Washington State. Mark Rypien missed installment No. 1 of BSU vs. WSU. He was in Bermuda golfing – of course – when Brett and the Broncos edged out the Cougars by three points at Albertsons Stadium. But Mark wouldn’t miss the second leg of this home-and-home. Saturday’s game between No. 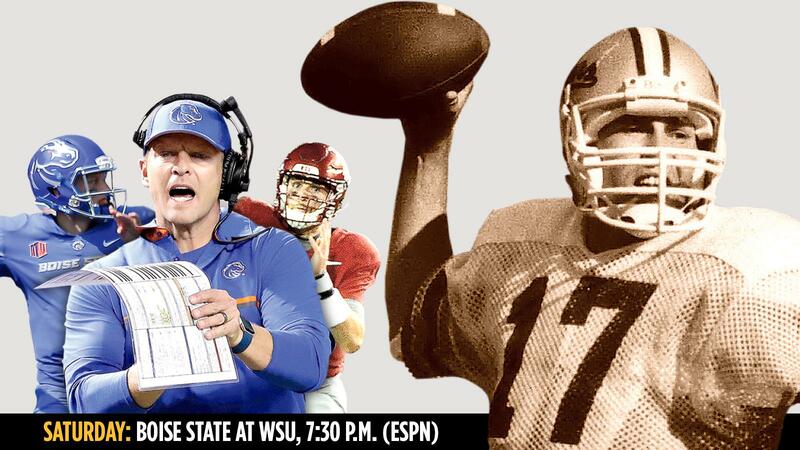 20 WSU and BSU at Martin Stadium is something of a Homecoming for Brett and everyone in the Rypien family has waited anxiously for it to finally get here. Assuming the region’s smokey air doesn’t prevent the game from happening altogether, at least one Rypien will leave Pullman a happy camper Saturday evening. Plenty of folks with the same last name plan to invade Martin Stadium for a game that’s taking place only 90 minutes away from the home base in Spokane. “I have to get a lot of tickets for this one,” Brett said on a teleconference Tuesday. The Rypien camp will be a mixed color palette this weekend. Presumably, Brett’s immediate family members will arrive in shades of Bronco blue and orange. But the BSU quarterback also has plenty of friends who attend WSU. Then there’s Mark, an avid BSU supporter every other week of the year who plans to dress every part of his body in crimson this w eek . A heap of passing yards and a few touchdowns from Brett wouldn’t hurt, Mark said, as long as the Cougars are on the winning end. “Yeah, 49-45 Cougs would be great,” the elder Rypien laughed. Mark hopes to see his nephew under center for all four quarters – with no exception. In BSU’s season opener against Troy, Brett was pulled in the second quarter and then again in the fourth for Montell Cozart, a graduate transfer from Kansas who’s more nimble than Rypien and maybe better suited to cover up deficiencies on the offensive line. BSU coach Bryan Harsin clarified early in the week Rypien is still the starter, but added that he could be spelled by Cozart if the Broncos feel it gives them a better chance to win. Mark Rypien isn’t such a fan. Brett’s is a battle-tested junior with thick skin and no shortage of mental fortitude, but Mark believes even bringing another QB into the picture could introduce a sense of doubt – both for the starter and the team as a whole. Brett will aim to knock off his uncle’s alma mater for the second year in a row, which would make it five consecutive wins for Boise State over Pac-12 teams. In the game last year, Brett was 19-for-35 passing with 299 yards, one touchdown and three interceptions – just good enough to get BSU over the hump. Of course, that game would quickly slip to No. 2 on the list of Martin Stadium favorites if Brett and the Broncos were to cause a Top-25 upset on ESPN Saturday night. Yes, the Broncos are always hungry for Pac-12 wins, but don’t be surprised if their quarterback has more of an appetite than usual this weekend. Published: Sept. 7, 2017, 8:56 p.m.